The thumbnails on folders for subfolders with images in it is really nice (original request is 4 thumbnails in 1 folder icon. When viewing folders with thumbnails and folders without thumbnails, this looks a bit ugly, since the folders with thumbnails are very large, whereas the other folders are small (normal Windows symbol). It might look better if all folders are displayed in same size. helmut wrote: The thumbnails on folders for subfolders with images in it is really nice (original request is 4 thumbnails in 1 folder icon. I don't think that names of subfolders should appear in the folders. Not quite sure why I find this strange, perhaps it's because we have the folder tree for viewing the hierarchy. I just had a second look at Explorer to see how folder without thumbnails are displayed, here. 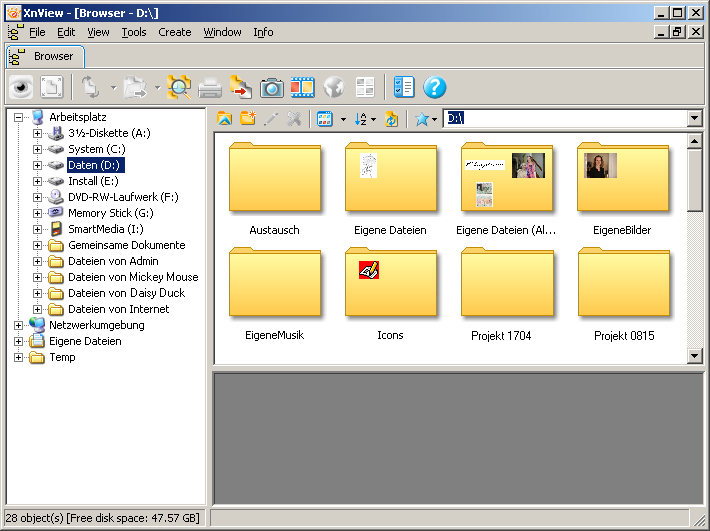 What Explorer does is to draw a rectangle around all folders (large ones with thumbnails and small folder symbols). This makes it look more harmonic. #HM01 does not look harmonic, #HM02 and #HM03 are better. When viewing many folders #HM01 might look like a big yellow wall, but shouldn't be too bad. 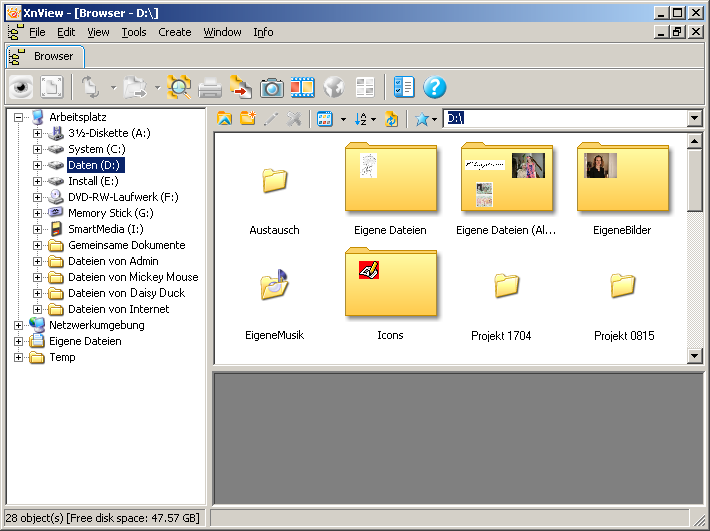 helmut wrote: I don't think that names of subfolders should appear in the folders. Not quite sure why I find this strange, perhaps it's because we have the folder tree for viewing the hierarchy. OK, it would also look bad for small thumbnails, but not all users use the folder tree, so at least this: ? Maybe there could be some special folder image instead of [ empty folder ]. I think it's important to know if there are subfolders (and how many) in folder . There is a new feature, thumbnails for text files, so it could be easy to implement maybe. helmut wrote: Personally I favour #HM02. I also prefer #HM02, which is more 'harmonic' (never used this word in english before... thanks ): you can see faster the folder 'type' without mixing between the different sizes as in #1 and #3. A small bug: currently the large folder symbol is not transparent but has a white background that can be seen near the tab: this stands out on dark-colored backgrounds only, of course. EDIT: sorry, just found out, the above bug had already been reported here http://newsgroup.xnview.com/viewtopic.p ... nail+label.